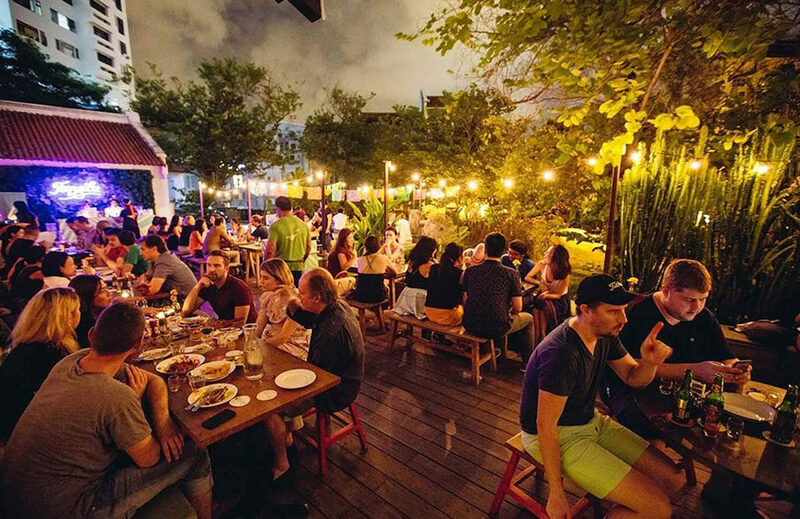 You can always expect a good vibe at Lucha Loco, an easy-going Mexican taqueria and garden bar in bustling Duxton Hill. Although the owners hail from Australia, brothers Christian and Julian Tan take their inspiration from their travels in Mexico, so you can expect Mexican street food style dishes amped up with contemporary twists and an excellent selection of artisan tequilas and mezcal. The atmosphere is always lively with great tunes blasting in the background, friendly service and tables full of people getting their eat and drink on. In fact, this is one of our top picks for Restaurants in Singapore with a Good Buzz. Expect Mexican favourites like icy cold Coronas, margaritas and tequila-based cocktails, as well as tacos, tostaditas and quesadillas dressed up with housemade sauces and salsas like mojo verde, lime crema and chili mango salsa. If the weather permits, we love sitting out back on the patio, especially if we can score a seat on the long cushioned bench next to the wall covered in Mexican wrestling posters. For drinks you can’t go wrong with one of their famous margaritas, which come in an array of flavours like Lychee, Mango and Blood Orange & Guava. We also love that they have tons of tequilas and mezcals that are hard to find anywhere else in the city and that they have a handy Tequila Fact guide on their drinks list to walk you through all the variations. With all that tequila, food is definitely a good idea, and a few dishes on our gotta-have list include the Elotes, grilled corn rolled in chipotle mayo and cotija cheese, the Chorizo con Res tacos with spicy chorizo, braised beef brisket, white cabbage salad and chipotle salsa, and the Huitlacoche quesadillas with Mexican truffle, wild mushrooms and epazote (a minty Mexican herb). Lucha Loco has over 70 tequilas and mezcals on their drinks list, which can be pretty daunting if you’re not really sure what you’re ordering. If that’s the case, try the Tasting Flight of Tequila & Mezcal to sample some of the house favourites. And if you’re having trouble choosing between all the tempting dishes on the menu, try the Chef’s Selection where you get a variety of classic Mexican street food dishes to share for the table. The El Loco includes five different dishes for $40+ per person, and the Head Honcho includes seven dishes for $60+ per person. Margaritas and cocktails range from $14+ to $18+, and plates of food average about $16+. Even better, they don’t add a mandatory service charge to the bill.